Today is the last day of the mid-test for the kids. Although next week they will still have their swimming and PE field test, that will not make me worry because I know they can do well. I made a snack bento for the kids today. They only have 15 minutes break between 2 subject tests. I didn't need a lot of time to prepare this snack bento for them. I explained to them that those little angels with little onigiri are the symbols that I made for all of the bento friends around the world who have helped and joined forces to raise funds for Japan. For all of you who doesn't know about Bento4Japan, please visit Bento4Japan HQ. Find out more on how can you help and take part. Bento4Japan auction on eBay is still going on, please check it out here. I saw the angels with their mini onigiri gifts right away! So happy with how well Bento4Japan is doing already! love the mini onigiri and angels..
lets hope for the best for Japan..
@Bobo : Thanks a lot Florence! 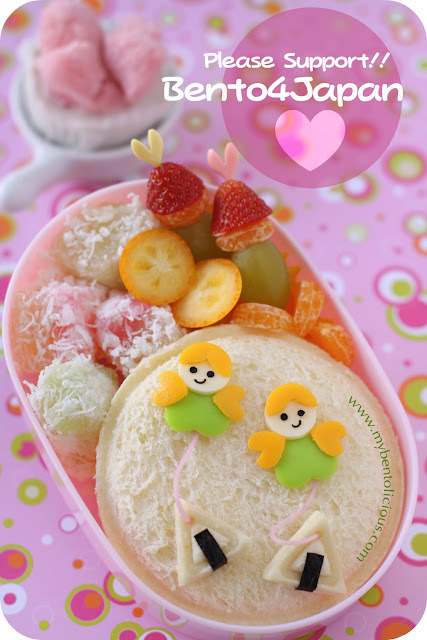 What a cute angels bento Lia! Love the onigiri idea too!